In the 1950s, and 1960s Mahalia toured, recorded and appeared on TV and radio. 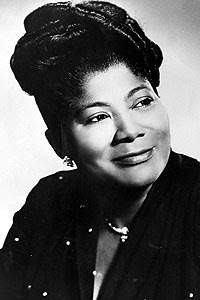 Though her recordings were rarely played on any but gospel and Christian radio, nevertheless she had a great influence on not just her genre but also on other younger artists. She promoted and mentored both Aretha Franklin and Della Reese - the latter joined Jackson’s gospel group at age 13. Anne Adams, who resides in Houston, Texas, has been a freelance writer for more than thirty years, publishing in both secular and Christian publications. She has published two books: Brittany Child of Joy (Broadman - 1986) and First of All, a Wife: Sketches of American First Ladies (pcpublications.org- 2007).